With a smooth left-handed swing, Alessandra Glickman drops a single down the third-base line and arrives at first base with a smile. Just like countless other kids, she is thrilled to be out playing baseball on a warm Sunday afternoon. But Alessandra Glickman isn’t like most kids. Alessandra was born with Down syndrome. After beginning to grow into a life that would always include certain challenges, she started losing weight and energy. A few months before her sixth birthday, doctors finally determined why when they found three tumors in her brain. 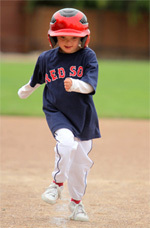 Read full article on Menlo Park Patch: Beating Brain Cancer with a Baseball Bat.